In the part one and part two of this tutorial we have discussed what PhoneGap mobile application framework is, its key components and elements. We have created a new PhoneGap mobile app project for iOS platform and started adding code for most used mobile application components. First such functionality was a communication with remote web services and 3rd party API’s through HTTP protocol by using jQuery library. Our mobile application has got a minimalistic and nice looking design created by using HTML5 markup and CSS styling. In this part of the tutorial we will be adding data storage functionality and native application controls. Yes, native iOS controls so our PhoneGap based mobile app has a native look and feel native to its users. Such possibility to add native elements to PhoneGap hybrid mobile applications is one of the biggest strengths of this framework. I’m going to be working with the code from the last tutorial part (you can find it on the bottom of the previous tutorial page). And the link to completed source code of today’s tutorial can be found at the end of tutorial. Lets get started. First we are going to write a code to store last keyword that was used for search on the mobile device and retrieve it (for refilling search text box) once user launches application next time. What storage for PhoneGap projects? In the part one of these series we have checked what PhoneGap mobile application framework is, downloaded its latest version and have created our initial first project for iOS smartphone platform. I have also outlined frame for example mobile app we are going to build and the set of web APIs that we will be using to make this example application somewhat useful for its users. In this part of the tutorial we will take a closer look to PhoneGap framework structure, its main files and will write code to consume data from the web based APIs. Lets call it slightly advanced “Hello World” example which instead of printing just simple text will display 5 yummy receipts retrieved from external web service. We will continue working on the code of the initial project created in the part one of this tutorial. You can follow the steps we took last time, they are quite simple. As we have much more code in this part, the all source code for today’s finished tutorial is located at the bottom of the post. Feel free to download and use it for testing. Now, lets get started. Let’s take a look at the structure and contents of the project created by PhoneGap script. Open the project with XCode (key tool for developing iOS based mobile applications). The structure will look the same as I have pictured below, with the key files for iOS project as well as PhoneGap specific www directory and few configuration files. 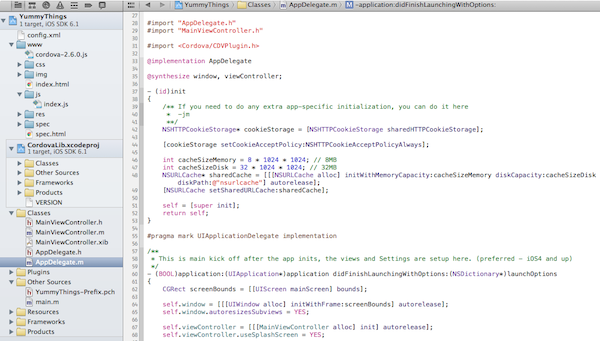 For iOS apps main.m objective-c implementation file represents the main loop application is constantly running. From the contents of this file we see that AppDelegate is being referenced as a main controller. Quick view to AppDelegate.m implementation file shows us that it sets some configuration parameters for the mobile project. Cache size, window size, splash screen, default start page for view controller (project default is always index.html) and other properties. The main directory where all application files have to be placed is www and they will be served via special custom view (web view). AppDelegate.m implementation file for newly created PhoneGap iOS project. Recently I had a chance to take a closer look at relatively new tool for creating interactive iPad tablet reading experiences called iBooks Author. It was released by Apple in January 2012 and is aimed at book authors and publishers to allow for an easy publishing of their books on Apple iBook platform. Application supports its own format .ibooks as well as .pdf and .ePub formats for exporting. In this tutorial I’m going to walk you through the steps for building fully working HTML5 widget to be used in iBooks Author projects. This sample widget will help eBook authors to easily add social follow option to their digital books so their readers can interact from within the eBook.